Liz had such a great time today, again! She had to do some unpleasant business first, school work. I know Melissa, that you are glad to hear that. We had lunch at Seasons 52; an awesome restaurant from the Darden Company. They own Olive Garden, Longhorn, Red Lobster and a few others. 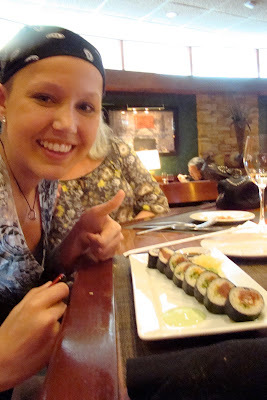 It was so wonderful, all dishes being 475 calories, and Liz had her sushi. From there we went and had a manipedi which is a mini manicure and mini pedicure and WE all loved it! We meet her uncle, Dave, at the 6:00 showing of La Nouba, cirque Du Soleil. It was Awesome! The top photo was her favorite part of the play. These people are incredible to watch! She is still asleep but will be going to the Disney Gaming Arcade today with Patrick and two of his friends. We leave for Fort Myers tomorrow morning to see Grandma and Grandpa Westhoven, Aunt Patti, and the Blakster. Blessings to all and I hope the weather is starting to get better for all of you. Whoo! Best day yet. Homework then food, then relaxing, then CdS. I think they're awesome! I'm so glad you guys are having fun. You deserve it! It sounds like you are having a blast! I am so glad you are getting out and about and enjoying yourself :) Have a wonderful rest of your vacation and as always lots of positive energy and thoughts are coming your way! WOW, I am jealous. I love Cirque! Two of the guys are from Trampoline Team on that show. Do you think Sean should try out??? Kinda risky. I hope you are enjoying everything and feeling good. One question: What is Christine wearing in the photo. Red and fluffy? Bye for now.We are in D.C. this weekend for trampoline meet. Call ya soon! Sounds like you guys are having so much fun! You both deserve it!